A view of the Tennessee State Capitol in 1864. 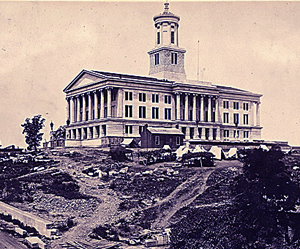 The cornerstone of the Tennessee State Capitol was laid on July 4, 1845. William Strickland designed the building and supervised construction until his death in April 1854. Two architects assisted in its completion. Strickland’s son, Francis, served as architect for the next three years. The last stone was laid in the tower cupola on July 21, 1855. Francis Strickland designed the cast iron roof decorations, which were cast in Nashville by T. M. Brennan. In 1857 the building commission dismissed Strickland. One year later, it hired Harvey M. Akeroyd to design the last room in the building, the State Library. Officially, construction was completed in 1859, but grounds work continued until the outbreak of the Civil War. As a result of the war, the final two gasoliers for the stair and the east lobby of the legislative floor were never ordered. The interior included space on the ground floor for the governor’s office, the State Archives, offices of the secretary of state, the treasurer, and the register of land, as well as the Tennessee Supreme Court, a federal district court, and the Repository of the Official Weights and Measures. The main floor contained the assembly halls for the House of Representatives and the Senate, legislative committee rooms, and the State Library, which is considered the finest room in the Capitol. The library features cast iron stacks, surrounding galleries, and a cast iron spiral staircase connecting the various stack levels. Wood & Perot Company provided the decorative iron work in the library, as well as the iron work for the staircases in the main building and the cupola tower. Portraits of various “worthies” decorate the ceiling of the library chamber. Beginning in the northeast corner and proceeding south, the portraits include Dr. Gerard Troost, first state geologist; historian William Hickling Prescott; James Kent, “father of American jurisprudence”; and Dr. James Priestley, noted geologist and president of Cumberland College. In the southwest corner, and proceeding north, the portraits include the Reverend Charles Coffin, president of the University of Tennessee; Dr. Philip Lindsley, president of the University of Nashville; Matthew Fontaine Maury, “pathfinder of the seas”; and poet Henry Wadsworth Longfellow. Until the mid-1880s, the State Library also housed the Tennessee Historical Society and most of its collections.